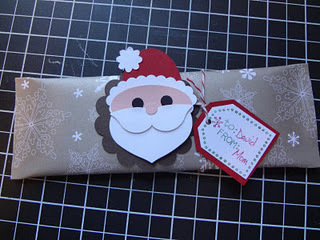 Christmas Candy Bar Wrappers – How Cute Are These??? I’ve decided candy bar wrappers are my new favorite things. They are cute and make the perfect little gift for teachers. We made our Thanksgiving Pilgrim candy bar wrappers and they were huge hits with my kid’s teachers. So when I started finding all these great Christmas ones, I figured I’d share them all with you. I like these because they are “sliders” or pockets. You make them and then slide the candy bar in. So clever! This snowman is a free printable! How cool is that! Now the hard part… which one will we make??? We’re linking to the linky parties on our sidebar. Great collection of wrappers…I love them too! Thank you for compiling this list. Definitely plan to make some of these! OMW. These are all fabulous! I would have a hard time choosing, too!!! I always look forward to your ideas. Please link up this post to the Handmade gift blog hop here: http://mysimplecountryliving.blogspot.com/2011/11/handmade-gifts-from-heart-blog-hop.html These are a great idea. Thanks for sharing. These are all cute ideas! Oh my heck- darling!! I love all of them! Such great ideas! I am pinning these to remember them- such great gifts for friends and neighbors! Thanks so much for linking up to Strut Your Stuff Saturday! We hope that you will join us tomorrow! these are so cute ideas. love them. These are adorable. Great for stocking stuffers! I like the reindeer best, lol Thanks for sharing! I love these! What a cute, festive way to give a candy bar! I am going to have to pass this on. My daughter bought candy bars for a friend of hers as a countdown to Christmas. This would be a great way for her to “wrap” them in style. It really add personality and caring to give a gift wrapped like this. What a cute inexpensive gift! They are all so adorable and who wouldn’t love to receive any as a gift? I love the reindeer. The snowmen look the easiest though! I’ve been seeing a lot of these candy wraps but gosh did you go all out with the details. I really like the reindeer! These are so creative and make such great stocking stuffers and/or treats to display for dinner guests. Thanks for the share. Lots of great choices! Good luck choosing! Thank you for sharing at Sharing Saturday!! Another project day with Grandma! Thanks for commenting. I didn’t make these, unfortunately. You’ll have to click on the links by the wrappers and it’ll take you to the blogs that make them.